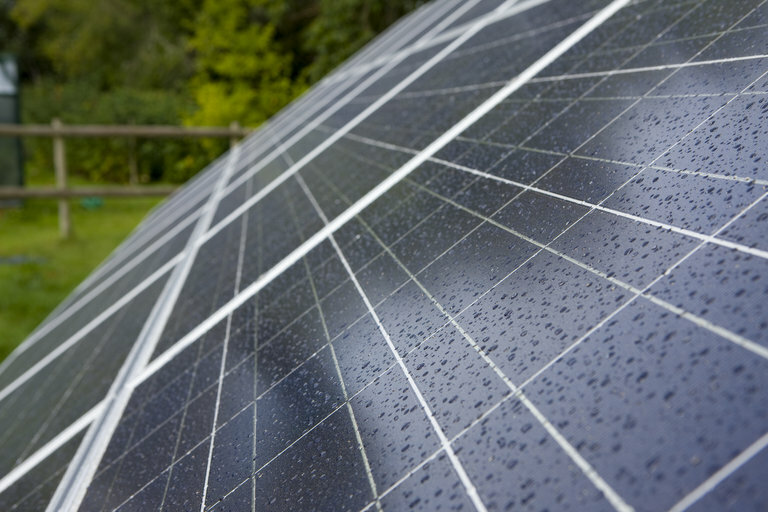 A new type of hybrid solar cell can charge even on drizzly days, collecting spare electrons from falling raindrops. Solar energy holds great promise as a renewable source of electricity, but solar panels have one Achilles heel — clouds. Now a team of Chinese researchers has announced a hybrid energy harvester that not only works in sunny weather, but also converts raindrops into electricity using nanogenerators. This isn’t the first time that engineers have played with the idea of capturing energy from falling raindrops using something called the triboelectric effect. Similar to static electricity, when raindrops make contact with certain surfaces, they shear off an electron. That creates a charge differential between the surface, which is negative, and the raindrop, which is positive, that can be exploited by nanogenerators wired into the surface material. In previous attempts at making “rain or shine” energy harvesters, researchers created a sandwich-style panel with a triboelectric rain capturer on top, an insulating layer in the middle, and the solar cells on the bottom. But the thickness of the layers created a lot of electrical resistance and blocked too much sunlight from reaching the solar panel. To address those inefficiencies, a team from Soochow University in China has created a new type of hybrid energy harvester where the triboelectric nanogenerator and the solar panel share a transparent electrode. Not only does the compact design allow sunlight to pass freely through the transparent layers, but special grooves etched into the materials boost the efficiency of both rain capture and absorbed sunlight, the researchers reported in an article published in the journal ACS Nano. Zhen Wen is an assistant professor with the Institute of Functional Nano and Soft Materials at Soochow University. In an email, he told Seeker that on sunny days, traditional solar cells can generate a lot more power than a triboelectric nanogenerator in even the stormiest weather, but the efficiency of solar cells drops dramatically with decreases in light intensity. A highly efficient triboelectric nanogenerator could make up for that loss. To build such a device, Wen and his colleagues turned to a surprisingly model — commercial DVDs. “DVDs are cheap and handy,” wrote Wen, explaining that DVDs come pre-etched with parallel grooves just hundreds of nanometers across. By imprinting both the top triboelectric layer and the transparent electrode with these same grooves, the researchers found they could boost surface interactions with the raindrops and trap sunlight that would otherwise be lost to reflection. Wen and his colleagues tested the hybrid device by exposing it to different simulated weather conditions. In sunlight, the silicon-based solar cells achieved a power conversion efficiency of 13.6 percent, which is only slightly lower than solar-only commercial panels. And simulated raindrops falling one per second from 5 centimeters up generated 2.14 volts of electricity. A larger-surface triboelectric generator could produce “hundreds of volts,” wrote Wen. With the expansion of solar energy projects worldwide, particularly in China, Wen said his lab’s rainy-weather innovation could be rolled out in three to five years. He’s also excited about the possibility of weaving hybrid rain-or-shine power generators into clothing.